In the comments, a remark from a different Steve stood out. Steve suggested using an array of Func<bool>. The comment didn’t generate any further discussion, but it’s worthy to call out. I don’t think the problem with the above code is with the goto per-se. I think the problem is how the code conflates “what to do” with “how to do it”. In this scenario both are a little bit tricky. Let’s assume we might need to add, remove, or change the order of the method calls. But, the method calls are so intertwined with conditional checks and goto statements that it obscures the process. Using an array of Func<bool> is a simple approach, yet it still manages to create a data structure that isolates “what to do”. The ability of functional and declarative programming to separate the “what” and the “how” is powerful, but you don’t need a new language, and you can start simple. 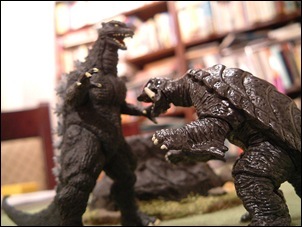 In this scenario it’s another tool you can use to save your city from the goto-zilla monster. I haven't tried compiling that, but I think it'd work. I think I would have written the original function with a try/finally block and return statements instead of goto, but I guess it would still have been a mixture of "what" and "how". I also don't see much point in comparing method calls with boolean return values to a literal boolean, but I guess that boils down to personal preference. I do like your alternative, though. You are assuming that the steps all have the same signature. This is as much an issue of language syntax as it is style. When all you have is a hammer... Come on, Func<T>s to do basic structured programming? If you don't want to use newfangled things like short-circuiting, or your check's more complicated than a boolean comparison, you could always use more than one function. Before someone says SRP or something like that, remember YAGNI. I know that it's "cool" nowadays to eschew exceptions but seriously... How is that goto even a contender? And the func<bool> is a neat trick, but it's working around a CREATED problem. Code should be readable. A simply try/catch (with each step throwing a StepFailedException) would have done wonders. is a pretty obtuse way of phrasing what you want, though, isn't it? yes, yes, of course the actual behaviour does what you want, but it feels more like it does what you want as a side-effect, than because that's what it's for. All() has a couple of problems here. One: it returns a bool, and using it without capturing the return value because all you want are the side effects is pretty abusive of the API. And two: it's called 'all'. Even though it is guaranteed to shortcircuit, its name implies that it will operate on every member of the enumeration. The fact you're evaluating a bool for equality with 'true' is also a bit of a codesmell - since it's completely unnecessary, you're presumably trying to communicate something to the maintenance coder about the significance of the result value from the function. If we're adding unnecessary code to make it more comprehensible, I'd suggest putting 'bool allOperationsSucceeded = ' before the .All() call to indicate what the method is doing. LINQy code always becomes awkward when you write lambdas with side-effects (and in this case, the side effects are actually the entire effect you're after). It has the same awkwardness as having side effects in the control condition of a while loop - it leaves a nasty taste. In this case, foreach with a break on a fail would be much clearer in its intent. WTF is wrong with else? For starters, I don't think you can't say which is the best solution, until you know what a "step" is, and what a "process" has to accomplish. Yes, I thought All wasn't very descriptive. Even worse would be something like Any() == false. That was the only reason for a separate method. That seems much simpler to me than all the other framework required for the functional solution. They will run in order until one is false. Scott, thanks for the nice tip. It's useful in winservice that runs behind my web site www.postjobfree.com. There are multiple methods that I need to run from winservice (e.g. GenerateCommentJobNotifications, EmailPreparedNotifications, RecalculateAllCategoryJobBlobs, DeleteResumeBlobsForDeletedResumes and many more). All methods have no parameters, are in separate library and tested separately. My goal is to have as little code as possible in winservice to run all that methods in sequence. Every method call has to be wrapped in try-catch block in order to make sure that all methods in sequence are successfully executed. I trimmed your code a little and use "Action steps" instead of "Func<bool> steps". So now my winservice code is getting cleaner, because in essence I need only to specify list of methods to call, without all that junk like try-catch-log. The minimal amount of code in winservice is critical, because winservice code is hard to test, and also because we frequently add, remove, or move methods between different timer handlers (EveryMinuteSequence(), Every10MinutesSequence(), EveryNightSequence()). blorg has the exactly right and only correct possible solution (!) It's clear what the function does and executes as expected. Early return wins the day again. Not that there's much point to this, for such a simple case. If there was some more complex setup/teardown logic to put around each step of the sequence, I could understand it. Otherwise, why not use && or try/finally? This conversation thread is a blast to read. Seriously. Is Scott's method the best way? Probably not. BUT, it is more readable, IMO, than the GOTO mechanism. Even reading Daniel's solution was fun, though I [obvioiusly] would never use it. This type of banter is really important to flush out ideas, and come up with the best practices of our craft. The more we talk and debate about our technique, the better our product will be. I really believe this. @Brian: Yes, I've enjoyed the comments, as surprising as some of them may be! Wow...I've seen a lot of very diverse solutions here...someone had mentioned trying to find the esoteric one. For my money, the best solutions out there was the two folks who SIMPLY said to AND the functions together. They will execute left-to-right and stop when one of them hits false. The others are kinda neat, but when you really need to get something done quickly that someone else is going to read and/or maintain, who has time to go through all of the other stuff?? Yes, a number of people have suggested this. I think it's ok, but it really doesn't express intent the way I like, and the moment you have to do something else (like log per method call), things get tricker. that's why I'd like to keep the order and the execution separate.